We have a deep, longstanding commitment to making a difference for those in need in our communities. Giving back to the community is an important part of QPWB culture. 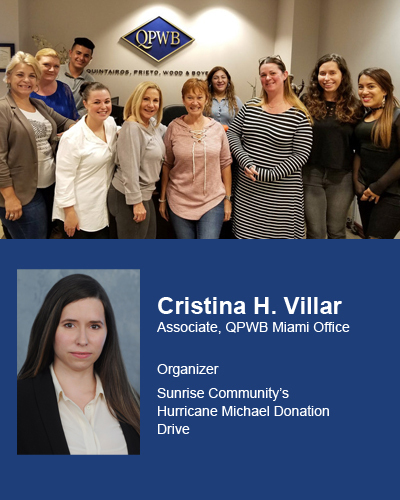 QPWB supports our attorneys’ desires to get involved within their neighborhoods by encouraging participation and contribution. The following highlights below exemplify their volunteer efforts. Quintairos, Prieto, Wood & Boyer, P.A. donated over 152 pounds of assorted goods and supplies to Sunrise Community’s drive assisting families affected by Hurricane Michael throughout Tallahassee and Panama City, Florida. Sunrise Community is a not-for-profit organization that provides people with disabilities assistance and support to enable them to live valued lives in the community. Quintairos, Prieto, Wood & Boyer, P.A. 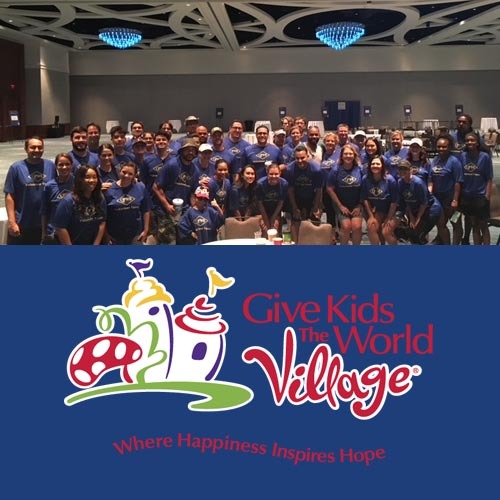 helped beautify homes for over 20 struggling families within the Orlando community as they left their homes to enjoy an expense-free vacation within The World Village, a whimsical non-profit resort in Central Florida. The World Village and its community partners provide children and their families accommodations in fully-furnished villas, transportation, tickets to theme parks, meals, daily entertainment and much more. Quintairos, Prieto, Wood & Boyer, P.A. 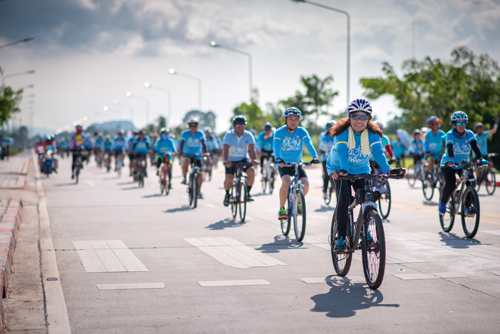 was a bronze sponsor of the American Diabetes Association’s 2018 Tour de Cure held in the Lake Nona Town Center of Orlando, Florida on March 25, 2018. 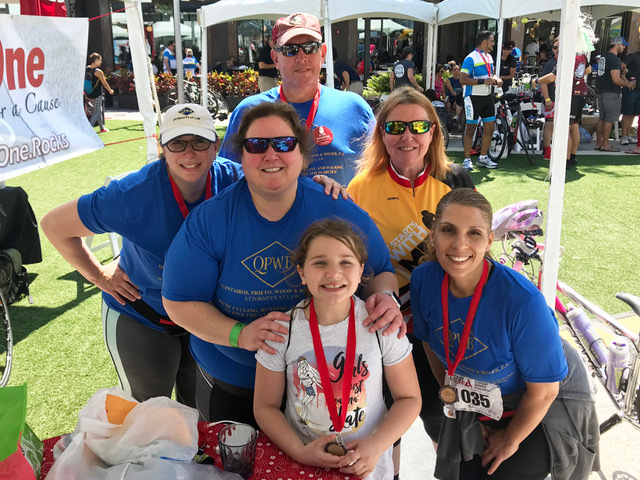 QPWB employees also walked, ran or cycled alongside approximately 1,500 participants to help raise over $800,000 that will help send kids to diabetes camp, fund research, provide medicine and supplies for those afflicted, coordinate advocacy programs and more. QPWB employees choose to run or walk a 5K or cycle for either 25 or 63 miles. Participants included Abbye Alexander, Deborah Moskowitz, Terry Melton and Melissa Cruz (pictured from left to right). Quintairos, Prieto, Wood & Boyer, P.A. 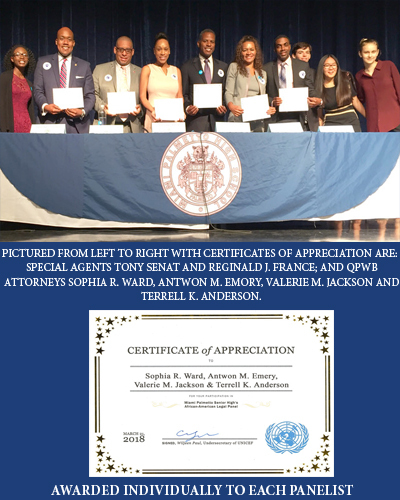 attorneys led a legal panel discussion focused on African-American Heritage on March 21, 2018 hosted by Miami Palmetto Senior High School and the UN’s UNICEF Committee—coinciding with the annual recognition of Black History Month. Challenges panel member have experienced in their professions and workplace including proving themselves and sacrifices made due to their race. What it really means to be African American in the Americas where slaves from Africa were brought to and around the world. Why the Black Lives Matter Movement exists, the present racial divide and how representation in blockbuster films such as “The Black Panther” help explore human concerns about the past, present and future. Panelists included QPWB Miami attorneys, Valerie M. Jackson, Antwon M. Emery, Sophia R. Ward and Terrell K. Anderson, along with Special Agents Tony Senat of the U.S. Department of Health and Human Services, Office of Inspector General, Office of Investigations in Miami, Florida; and Reginald J. France, Assistant Special Agent-in-Charge of the Miami Field Office of Homeland Security Investigations. QPWB participants included Brian Fery, Vanessa Braga, Robin Khanal, Michelle Vazquez, Melissa Cruz and Molly Lomonaco (pictured from left to right). Quintairos, Prieto, Wood & Boyer, P.A. 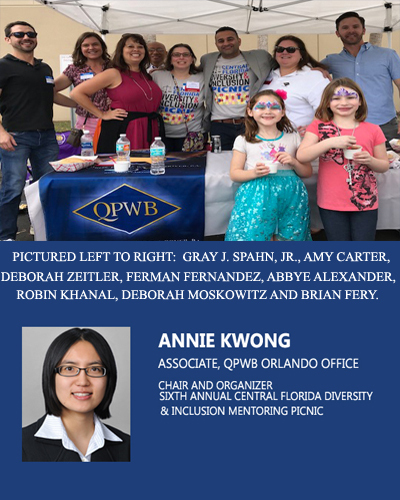 was a Gold sponsor of the Sixth Annual Central Florida Diversity & Inclusion Mentoring Picnic held at Barry University on January 27, 2018 to mentor law students across central Florida. Over 300 legal community members attended this event including local judiciary, lawyers, members of the local bar associations, law firm representatives and 14 QPWB attorneys. The picnic focused on diversity beyond race and gender and included a “speed mentoring” session, where law students spoke with legal practitioners about the field. Quintairos, Prieto, Wood & Boyer, P.A. sponsored, fundraised and participated in Ronald McDonald House Charities of Central Florida, Inc.’s 8th Annual ‘Ride-4-Ronald’ event held in October 2017 to benefit families in need. More than 20 Quintairos, Prieto, Wood & Boyer, P.A. 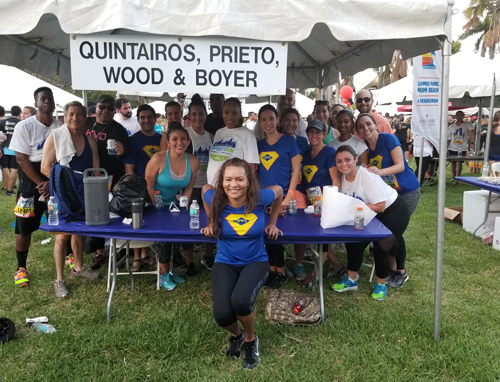 attorneys participated in Corporate Run 2017 in Downtown Miami during the month of April to benefit community health and United Way of Miami-Dade. 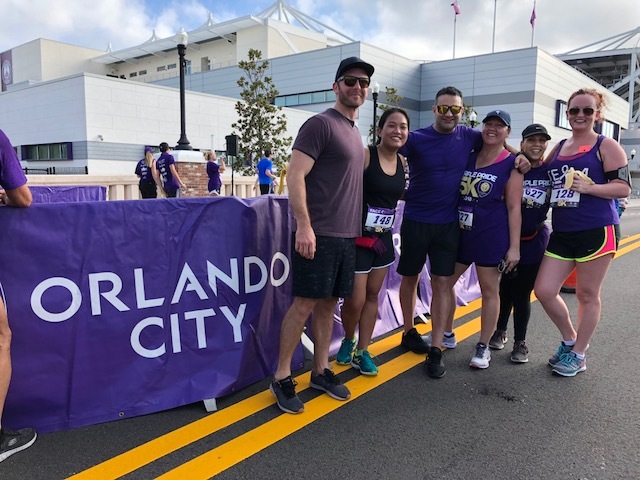 Dubbed the “Largest Office Party,” the corporate run brings together over 845 local companies every year to show their commitment to health and physical fitness. Quintairos, Prieto, Wood & Boyer, P.A. 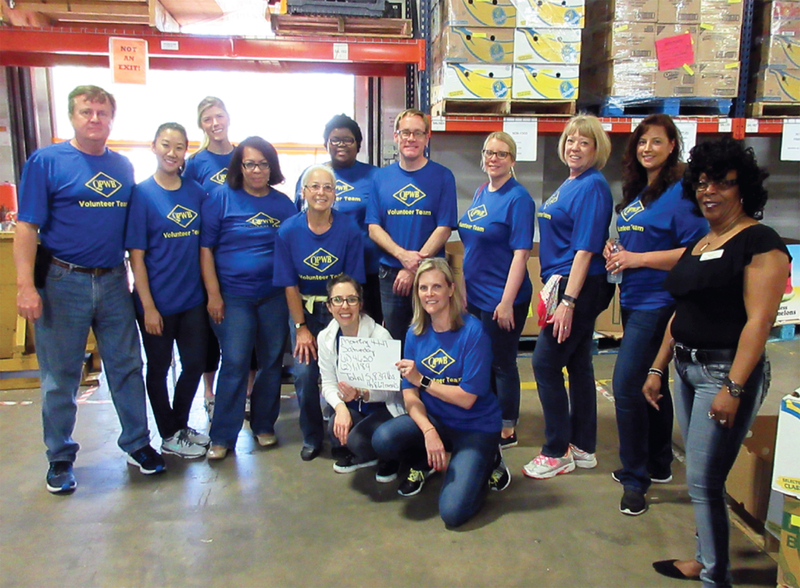 Jacksonville staff volunteered at Feeding Northeast Florida in April 2017, which aims at establishing food security across 8 counties. Together, about 5,839 pounds of food was processed during this event, totaling to 4,867 meals. Feeding Florida is affiliated with Feeding America, the nation’s leading hunger-relief organization.